The WPL610 industrial barcode printer sets a new standard for industrial barcode printing. It"s the most powerful barcode printer in the Wasp line, delivering advanced print speeds, durable construction, and high-volume barcode printing in mission-critical applications. Maximize your efficiency and throughput with print speeds of up to 12 ips, facilitated by 32 MB SDRAM and 8 MB Flash memory. 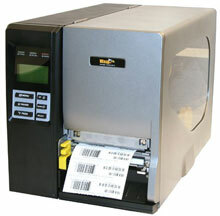 The WPL610 industrial barcode printer includes the features your application requires, at no additional charge. Peel and present functionality allows for quick application of labels. Flexible connectivity options, including internal Ethernet print server, USB 2.0, parallel and RS-232, make installation easy. The WPL610 industrial barcode printer boasts all-metal construction for endurance and reliability in demanding environments. Designed to offer seamless integration, the WPL610 includes an integrated LCD control panel for easy-set up and printer management. The clear media view panel allows users to monitor ribbon and label usage. The WPL610 industrial barcode printer features side-load media design, for improved efficiency in replacing media.